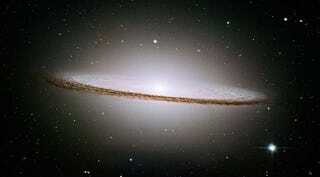 This classic image of the Sombrero Galaxy, taken by the Hubble Telescope, shows you the globe of light emitted by 100 billion stars. Sadly, we could never behold such an image with our naked eyes. It's important to remember, however, that the Hubble image is actually a long CCD time-exposure to light gathered by a 240 cm mirror. If you could be somehow transported to a location in space where M104 looms large in the sky, you would see that HST imparts a severely inflated expectation. From a distance, say, of 300,000 light years, M104 would be so dim that you would see only a faintly ominous, faintly glowing flying saucer.